Oriol Romeu admits it is a 'dream' to be playing for Chelsea after he made his UEFA Champions League debut earlier in the week. The promising midfielder joined in the summer from Barcelona and was handed his first European start for the club in the 5-0 thrashing of Genk on Wednesday. He produced a solid performance for the Blues on the back of two substitute appearances in the Premier League and he is delighted to be part of Andre Villas-Boas' squad. 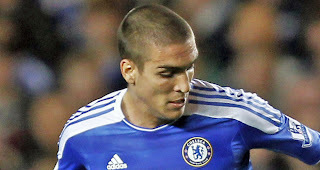 Romeu feels that the increase in Spanish contingent at Chelsea, following the arrival of himself and Juan Mata in the summer, as well as Fernando Torres in January, has helped all of them settle more quickly into life with the Blues.